Opvizor Update – Kill those snapshots !! Opvizor is a product that is aimed at proactively addressing any critical errors in your vSphere environment and fixing them. Its unique turnkey solution is built on the premise that it proactively health checks and provides solutions to your vSphere Admin so they can concentrate on other work. Today sees the release of a new free beta tool called ‘Snapwatcher‘. You can finally say goodbye to those sneaky broken and invalid snapshots hiding in your VMware environment !!!! Snapshots are almost a prerequisite in virtualisation, as they give virtual machine administrators the ability to return to previous stages if problems occur inside virtual environments. Unfortunately these same snapshots can quickly hog your disk space if you don’t regularly monitor and manage your virtual environment. Many invalid snapshots occur automatically when backup solutions trigger snapshot creation and deletion; whenever VMware struggles to delete a snapshot, an invalid snapshot is born. Broken snapshots can grow like wildfire if you’re not keeping track of them, and quickly balloon to consume most of your free disk space. The team at Opvizor noticed hundreds of terabytes of wasted broken or invalid snapshots in their customer environments and had a real passion to attack this head on. The problem with these snapshots are that a single Snapshot’s Delta-file is able to grow to the same size of the original file. Broken snapshots are a common problem and affect 81% of all VMware vSphere environments. If left undetected, they can easily amass and cause space shortages in datastores. 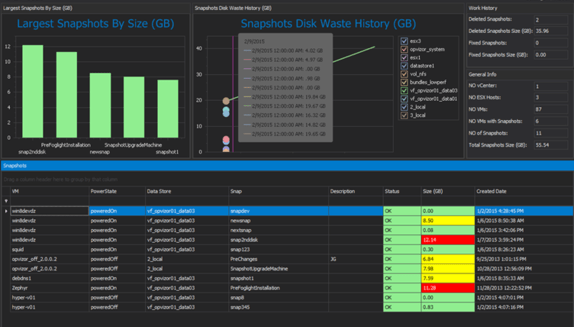 Snapwatcher is designed to be simple to use. With a single click, anyone can find and fix old, broken or invalid snapshots. 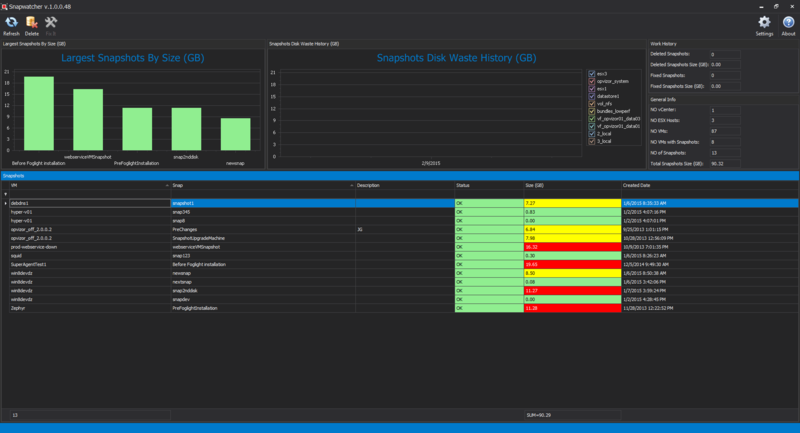 Through system wide monitoring of the VMware vCenter systems, Snapwatcher monitors all VMware snapshots and sends progress reports to notify you of how much space it was able to free by repairing or removing the snapshots. Its been a while since my last post and I’ve been keeping tabs on all the IT Tech news, blogs, and the local VMUGs that have past including the UK National Conference which was very well attended and had some excellent presentations by Jason Langone, Joe Baguely and Brian Gammage to name a few. The recent Danish VMUG was very good by all accounts and some very good presentations including an interesting one from LEGO on moving from 1 datacenter to another. But enough of news – let’s focus on the headline.